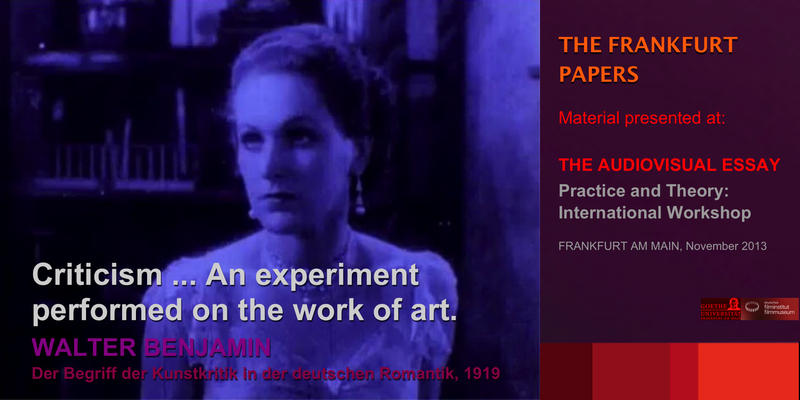 This section of the Audiovisual Essay: Practice and Theory of Videographic Film and Moving Image Studies proudly presents the collected papers and screening programme from the Audiovisual Essay: Practice and Theory International Workshop presented by the Film, Media and Theatre Studies Department of Goethe University and the Deutsches filmmuseum, Frankfurt in November 2013. The event was organised by Cristina Álvarez López and Adrian Martin, with advice and support from Vinzenz Hediger. Thanks to all the participants and film artists who have shared their work at this event for this record of it, especially Cristina and Adrian. The conference programme is given, in English, below. All of the papers and the screening program are linked to from their entries. “There is a new development in film culture, cutting across academic studies and fan websites: it has variously been called the audiovisual essay, videographic film/moving image studies or digital criticism. In the simplest terms, all these terms refer to the use of images and sounds – sampled, re-edited, re-mixed – to help carry out the work of analysis, appreciation or critique of cinema and media texts … work that was once, traditionally, carried out mainly in written-word forms. The two languages of the conference [were] English and Spanish. Papers delivered in Spanish (by Carlos Losilla, Cristina Álvarez López & Manu Yánez) [were] accompanied by English translation projected on-screen. Long after the advent of the digital era, the overwhelming majority of university-based film and moving image scholars still prefer to carry out and publish their research in conventional written formats. As digital publications continue to proliferate, however, more and more academics are turning to multimedia forms of research like digital video essays. Such formats can inspire compelling work not only because, with their possibilities for direct citation, they can enhance the kinds of explanatory research that have always been carried out on films, but also because of their potential for more ‘poetic’, creative and performative critical approaches to our research. Should we be aiming to ‘translate’ written film studies into audiovisual ones, or should we embrace from the outset, the idea that we are creating ontologically new scholarly forms? Catherine Grant, Senior Lecturer in Film Studies/University of Sussex, is author of [by September 2014, around ninety] film-studies videos many of which have been screened internationally at academic conferences and at film festivals and industry events She has curated hundreds of videographic studies at her websites Film Studies For Free, Filmanalytical and Audiovisualcy. To what extent does the audiovisual essay feed the imaginative potential of film criticism? Where does it stand in the battle between consciousness and unconsciousness? Or in the dichotomy of thought and action? What is the relation established between the critic-essayist and the images that s/he manipulates? These are the various questions that point to a fundamental issue: is there a point at which the audiovisual essay ceases to be a work of film criticism? Manu Yánez, film critic for the magazine Fotogramas, the newspaper ARA (Barcelona) and the website Otros Cines (Argentina), is the editor of the anthology La mirada americana: 50 años de Film Comment (he also writes for this American magazine). There are images that films do not give us to see, but which, at the same time, can become what we most desire. To the point of manifesting themselves in our thinking about cinema, so that we might elaborate narratives (personal, critical, analytical …) around what never actually existed. Is cinema an evocation of phantoms, to the point of wanting to capture spectres of the invisible? This reflection seeks to demonstrate the materiality of what I have referred to as ‘unspeakable images’ (see a preliminary text on this theme in LOLA, no, 4, September/October 2013, www.lolajournal.com) – and their critical relationship to the new culture of the audiovisual essay. Carlos Losilla teaches film at Universitat Pompeu Fabra in Barcelona. He has edited many collections and contributed to magazines including Caiman, Nosferatu and Transit. His latest book is La invención de la modernidad o cómo acabar de una vez por todas con la historia del cine (2012). There is no doubt that the video essay challenges established genres and academic divisions of labour, in the same way that Adorno attributed to the written essay. The question is what exactly we mean when we talk about ‘criticism’ (Kritik) in relation to the new forms of digital criticism. To answer this question, my contribution takes a clue from the notion of criticism developed by the German Romantics. Criticism in the sense of the Romantics, writes Walter Benjamin, “is a kind of experiment performed on the work of art which awakens the art work’s inherent potential for reflection, through which the work acquires a consciousness of itself”. If we define film as a medium of reflection, i.e., as a medium that always already contains its own critique, we can describe the video essay precisely as the “experiment performed on the work of art” that Benjamin describes. In order to substantiate this claim, this contribution focuses on what may be described as the material of the essay, the excerpt, and asks what exactly an excerpt does. Vinzenz Hediger is Professor of Film Studies at Goethe Universität Frankfurt. Whether we see the burgeoning audiovisual essay as tending more to the rhetorical, demonstrative form of the written argument, or towards the free-associative ways of poetry, one thing shared by both tendencies is definitely up for renewed scrutiny: the role of editing, in the strong sense of carefully deliberated montage. What happens when we mix and edit together edits and sounds from often wildly diverse, and differently material, film objects? Can we experience a ‘bad match’ (faux-raccord) between two found-fragments? Can a bunch of heterogeneous images and sounds form a homogeneous, seamless whole? Should they? Is the kind of montage that Adorno imagined in Aesthetic Theory possible: the formed, critical work that nonetheless displays the diversity of its parts? Cristina Álvarez López is co-founder and Co-Editor of the Spanish online film journal Transit: Cine y otros desvíos. Her critical writing and audiovisual essays have appeared in MUBI, Frames, Contrapicado, La Fuga, LOLA and De Filmkrant. Adrian Martin is currently Professor of Film Studies at Goethe University, Frankfurt, and formerly of Monash University, Melbourne. He is the author of six books, and Co-Editor of LOLA and Screening the Past.